Photograph showing the teacher and class at Mt. Airy School in Shenandoah County, ca. 1914. The school was located in the Fairview/Jadwyn community near the intersection of what is now Back and Alonzoville Roads. Rear row: Lester Hottel (teacher), Lawrence >, Ruth Windle, Vergie Gocnehour, Bul Windle, Nellie Windle, Lilly Cook, Mary Gochenour, Rosie Feller Mowery, Fred Barr, Carl Feller, Josiah Fravel, and Raymond Neff. Folder 3.6: Photograph of Mt. 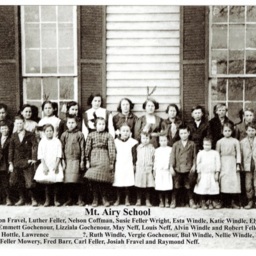 Airy School with teacher and pupils identified, ca. 1914, Shenandoah County Photograph Collection, Truban Archives, Shenandoah County Library, Edinburg, Virginia. Unknown, “Mt. 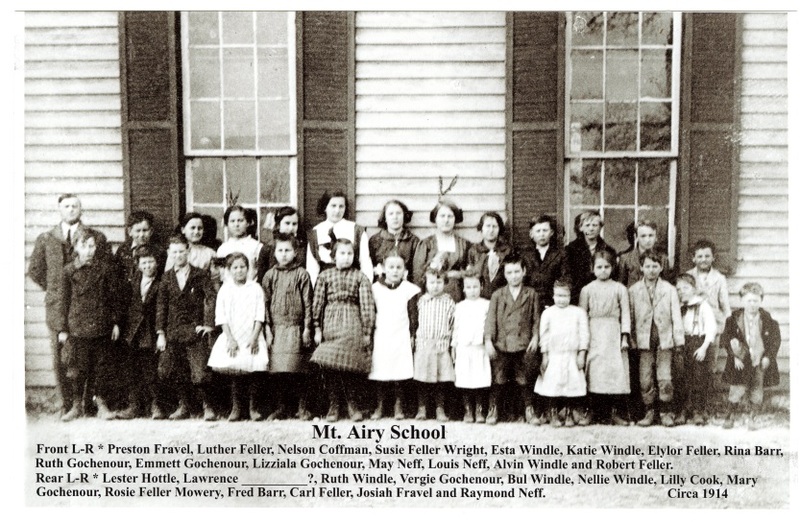 Airy School Class,” Shenandoah County Library Archives, accessed April 22, 2019, http://archives.countylib.org/items/show/11760.